Pre-Hospice Care At Home Helps Keep Patients Out Of The Hospital : Shots - Health News Through home visits, very ill people get help with pain, stress and symptoms. Medical centers, initially skeptical, now embrace the program because it helps patients and makes financial sense. At Gerald Chinchar's home in San Diego, Calif., Nurse Sheri Juan (right) checks his arm for edema that might be a sign that his congestive heart failure is getting worse. "If they told me I had six months to live, or [could instead] go to the hospital and last two years, I'd say leave me home," he said. "That ain't no trade for me." 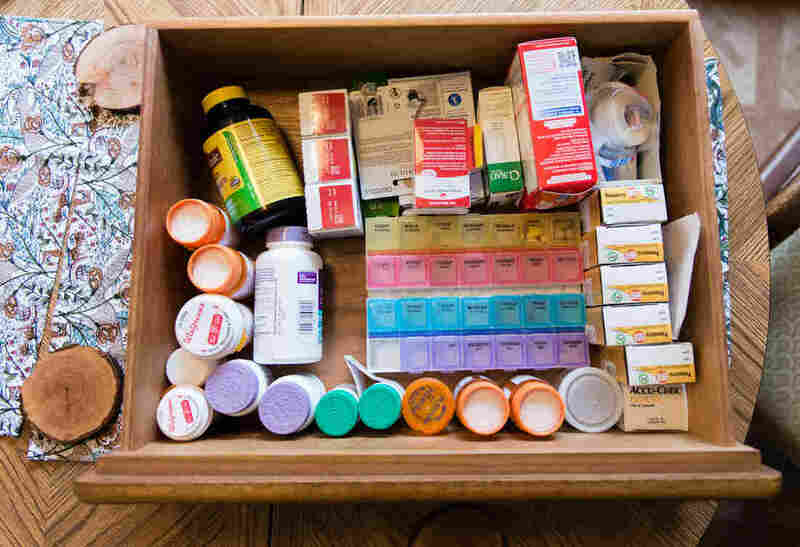 All the medicine Chinchar takes for his congestive heart failure and other ailments fills a kitchen drawer. "What we like to do as a palliative care program is streamline your medication list," the nurse explained during a home visit. "They may be doing more harm than good." Unlike hospice care, patients in this program don't need to have a prognosis of six months or less to live, and they can continue getting treatment that is aimed at curing their illnesses, not just treating symptoms. "Transitions is for just that point where people are starting to realize they can see the end of the road," said Dr. Dan Hoefer, a San Diego palliative care and family practice physician, and one of the creators of the program. "We are trying to help them through that process," he said, "so it's not filled with chaos." The importance of programs like Transitions is likely to grow in coming years as 10,000 baby boomers — many with multiple chronic diseases — turn 65 every day. 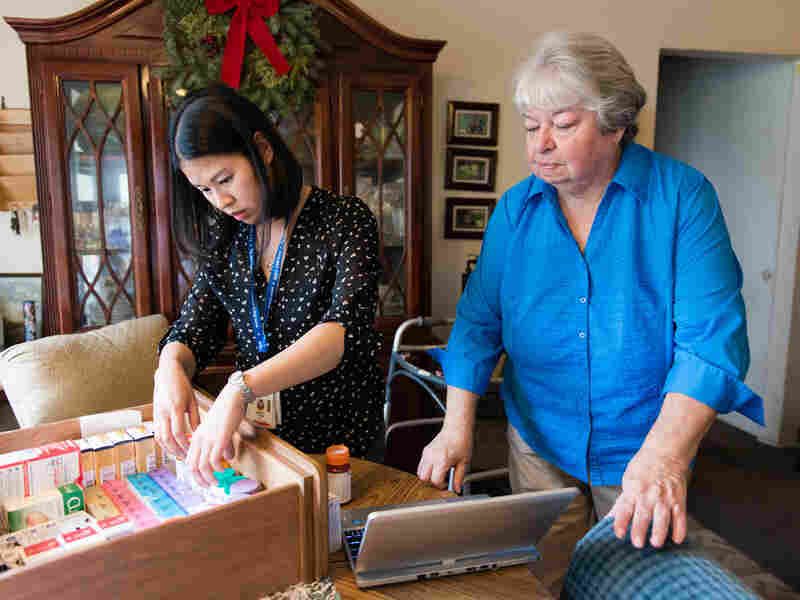 Transitions was among the first of its kind, but several such programs, formally known as home-based palliative care, have since opened around the country. 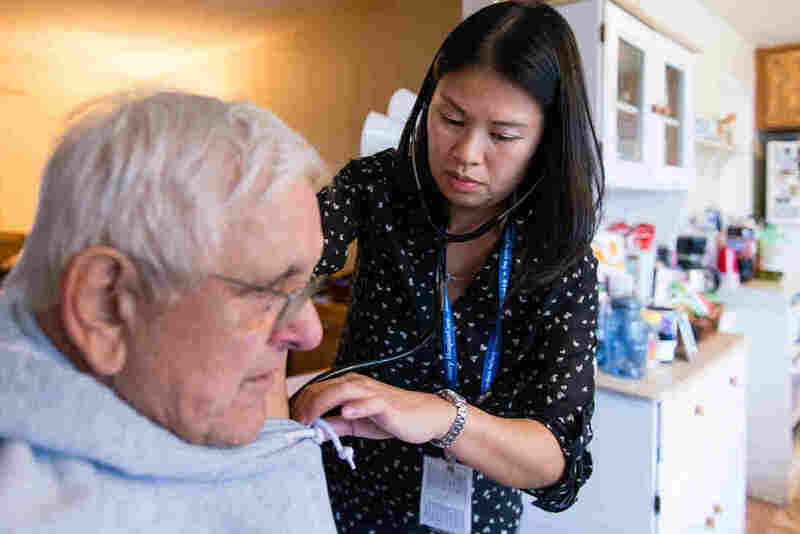 They are part of a broader push to improve people's health and reduce spending through better coordination of care and more treatment outside hospital walls. "We thought, 'Wow. We have something that works,'" said Susan Enguidanos, an associate professor of gerontology at the University of Southern California's Leonard Davis School of Gerontology, who worked on both studies. "Immediately we wanted to go and change the world." "I liken it to paddling out too soon for the wave," she said. "We were out there too soon. ... But we didn't have the right environment, the right incentive." Hoefer is a former hospice and home health medical director and has spent years treating elderly patients. He learned an important lesson when seeing patients in his office: Despite the medical care they received, "they were far more likely to be admitted to the hospital than make it back to see me." Hoefer's colleague, Suzi Johnson, a nurse and administrator in Sharp's hospice program, saw the opposite side of the equation. Patients admitted into hospice care would make surprising turnarounds once they stopped going to the hospital and started getting medical and social support at home, instead. Some lived longer than doctors had expected. Despite the concerns, Sharp's foundation board gave the pair a $180,000 grant to test out Transitions. And in 2007, they started with heart failure patients and later expanded the program to those with advanced cancer, dementia, chronic obstructive pulmonary disease and other progressive illnesses. 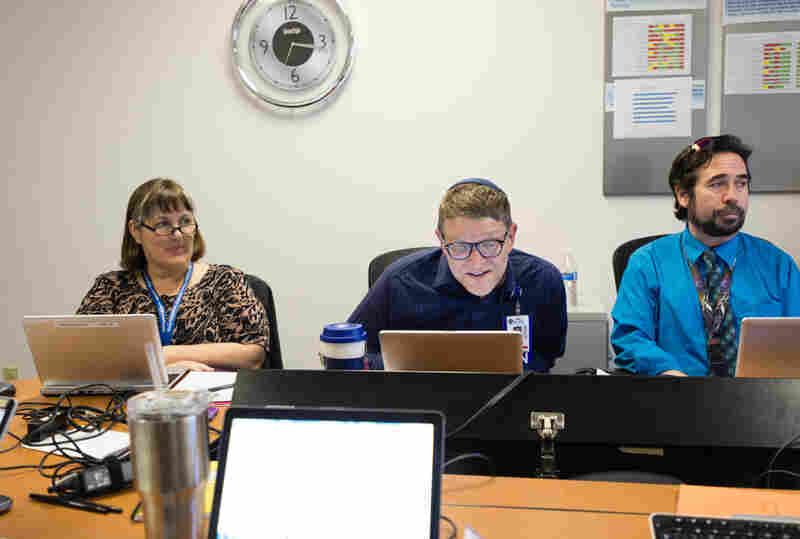 They started to win over some doctors who appreciated having additional eyes on their patients, but they still encountered "some skepticism about whether it was really going to do any good for our patients," said Dr. Jeremy Hogan, a neurologist with Sharp. "It wasn't really clear to the group ... what the purpose of providing a service like this was." 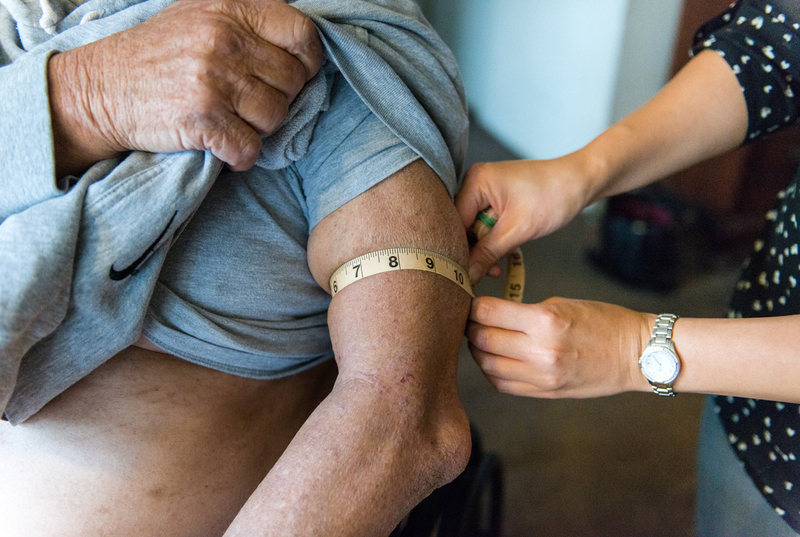 Hoefer said doctors started realizing home-based care made sense for these patients — many of whom were too frail to get to a doctor's office regularly. "At this point in the patient's life, we should be bringing health care to the patient, not the other way around," he said. Late last year, Gerald Chinchar's doctor recommended he enroll in Transitions, explaining that his health was in a "tenuous position." Chinchar has nine grandchildren and four great-grandchildren. He has had breathing problems much of his life, suffering from asthma and chronic obstructive pulmonary disease — ailments he partly attributes to the four decades he spent painting and sandblasting fuel tanks for work. Chinchar also recently learned he had heart failure. Gerald Chinchar's wife, Mary Jo (right), told the visiting nurse she especially appreciates getting the advice about what her husband should eat and drink. He doesn't always listen to his wife, Mary Jo said. "It's better to come from somebody else." That's where Juan comes in. Her job is to make sure the Chinchars understand Gerald's disease so he doesn't have a flare-up that could send him to the emergency room. She sat beside the couple in their living room and asked a series of questions: Any pain today? How is your breathing? "What we like to do as a palliative care program is streamline your medication list," she told him. "They may be doing more harm than good." His wife, Mary Jo Chinchar, said she appreciates the visits, especially the advice about what Gerald should eat and drink. Her husband doesn't always listen to her, she said. "It's better to come from somebody else." Sutter Health operates a project called Advanced Illness Management to help patients manage symptoms and medications and plan for the future. The University of Southern California and Blue Shield of California recently received a $5 million grant to provide and study outpatient care. 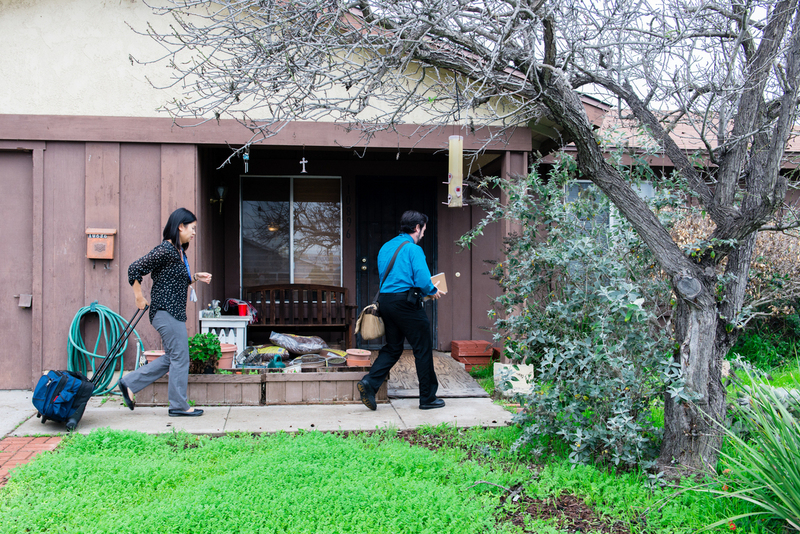 "The climate has changed for palliative care," said Enguidanos, the lead investigator on the USC-Blue Shield project. Ritchie said she expects even more home-based programs in the years to come. "My expectation is that much of what is being done in the hospital won't need to be done in the hospital anymore and it can be done in people's homes," she said. Challenges remain, however. Some doctors are unfamiliar with the approach, and patients may be reluctant, especially those who haven't clearly been told they have a terminal diagnosis. Now, some palliative care providers and researchers worry about the impact of President Donald Trump's plans to repeal the Affordable Care Act and revamp Medicare — efforts that seem to be back in play. Gerald Chinchar, who grew up in Connecticut, said he never expected to live into old age. In his family, Chinchar said, "you're an old-timer if you make 60." This story is part of NPR's partnership with Kaiser Health News. KHN is an editorially independent program of the Henry J. Kaiser Family Foundation, a nonprofit, nonpartisan health policy research and communication organization not affiliated with Kaiser Permanente. You can follow Anna Gorman on Twitter: @annagorman.